The Newburyport Preservation Trust is a non-profit membership organization that brings together people from Newburyport and beyond who value the preservation of the city’s period architecture, neighborhood ambiance, heritage landscapes, and authentic historic character. For the most immediate preservation advocacy news, visit the Newburyport Preservation Trust Facebook page. NPT's signature event is Preservation Week, the annual spring celebration of the city's preservation that attracts residents and visitors alike for tours, lectures, social events, and the Preservation Awards ceremony. 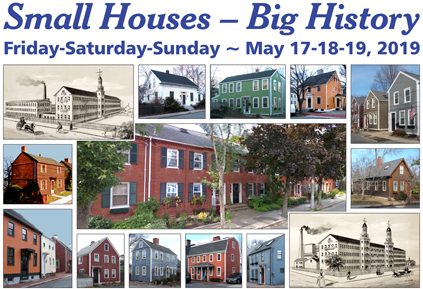 This year's theme is "Small Houses - Big History." For the complete schedule of events, download the 2019 preservation Week flyer, or click on the "Events" page link at left. Plaque Program, now in its fourth year, continues to build momentum. Owners of the hundreds of historic homes in Newburyport now have the opportunity to proudly identify their house with a plaque that indicates the owner/builder, their occupation (if known), and date. Central to the program, and of particular historical value, is the verification of dates, names, and facts by experienced researchers. Dedicated stewards of Newburyport's older homes can begin to learn the factual background of their home, and showcase their stewardship with a plaque validated by the Newburyport Preservation Trust. See complete information about the program at our dedicated Historic House Plaque Program page, including how you can apply for a plaque. Newburyport’s past preservation – thanks to both circumstance and vision – has come to define who we are and anchors our quality of life. Today all Newburyporters have a stake in the authenticity of the city’s historic character. The Newburyport Preservation Trust aims (1) to be a voice for preservation concerns, (2) to promote preservation education, (3) to foster awareness of the need for preservation, and (4) to encourage compatible new development. The Newburyport Preservation Trust is among the select affiliate members of Historic New England, the largest regional preservation organization in the U.S. 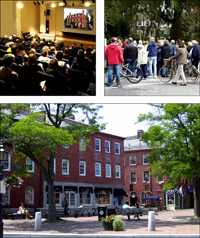 The Newburyport Preservation Trust web site offers information on its programs and projects, as well as introductions to Newburyport history and architecture. Throughout the site are annotated links to useful preservation resources. Have a look around – and then join us on our Membership page! Preservation Week 2019 is May 17-19! Winter 2019 Newsletter is hot off the press!